Today I´m going to explain how to plan your workouts like a pro. Planning your training sessions is key to succeed. I bet you´ve heard the famous quote “Failing to plan is planning to fail”. 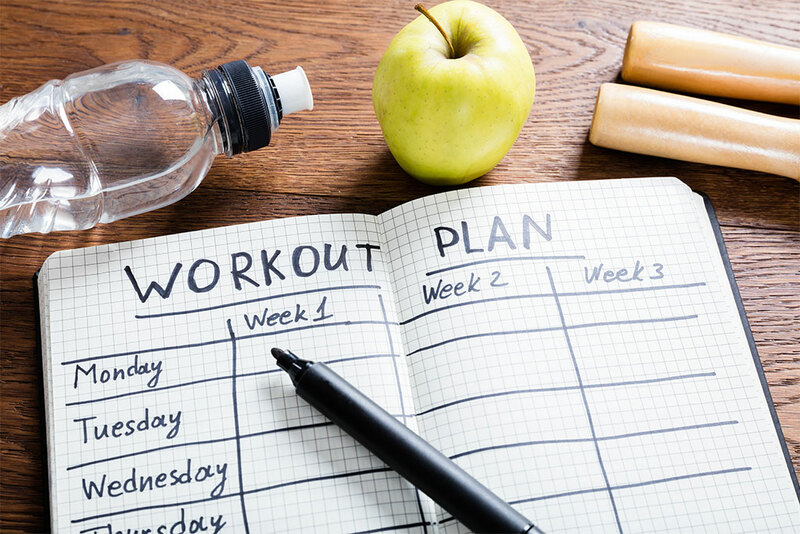 When it comes to fitness plans, “failing” means not meeting your goals and expectations. You have to plan ahead to meet your goals because it takes much more than motivation and goodwill to get there. The technical term for this kind of planning is “periodization”. It is the process of dividing an annual training plan into specific time blocks. Each block has a particular goal. This allows us to create hard training periods and easier periods, to facilitate recovery. Periodization also helps us develop different physiological abilities during various phases of training. Let´s say you have found a workout routine that works well for you. That´s great but, lately, no matter how hard or how often you work out, you just can’t seem to progress any further. You’re stuck on a plateau. This is because your body has adapted to the exercise you’ve been doing. You need to “shock” or “surprise” your body, give it a new challenge periodically if you’re going to continue to make progress. Instead of doing the same routine month after month, you change your training program at regular intervals, “periods”, or “cycles” to keep your body working harder, while still giving it adequate rest. That goes for both strength and cardiovascular training. The goal with periodization is to maximize your progress while also reducing your risk of injury. It also addresses peak performance for competition or meets. Periodization, if appropriately arranged, can peak the athlete multiple times over a competitive season (Olympic weightlifting, powerlifting, track and field) or optimize an athlete’s performance over an entire competitive season like with soccer or basketball. The macrocycle is the longest, and includes all four stages of a periodized training program: endurance, intensity, competition and recovery. All 52 weeks of your annual plan. For example, if you want to peak for an event one year from now, you can mark that date on your calendar and work backward to create a program that allows you to peak at that time. You can use the same process to identify several major events throughout the year and develop a plan that facilitates multiple fitness peaks. The mesocycle represents a specific block of training that is designed to accomplish a particular goal. Mesocycles are typically four or six weeks in length. For instance, during the endurance phase, you might develop a mesocycle designed to enhance your muscular endurance for six weeks. A microcycle is the shortest training cycle, typically lasting a week with the goal of facilitating a focused block of training. Generally speaking, four or six microcycles are tied together to form a mesocycle. You can get the most out of your training by having a good understanding of each of the three cycles of periodization and then using these cycles to create a plan that allows you to peak for your most important events throughout the year. There are many different types of periodized strength-training programs, and many are geared to the strength, power and demands of specific sports. You should also periodize your cardiovascular training for the same reasons: challenge your body while still allowing for adequate recovery time. For example, you’re a recreational runner, running for fitness, fun and the occasional short race, you’ll want to allow for flat, easy runs, as well as some that incorporate hills and others that focus on speed and strength. What you don’t want to do is complete the same run every time. If you run too easily, and don’t push yourself, you won’t progress. And chances are you’ll get bored. Conversely, too much speed or high-intensity training will lead to injury or burnout, and most likely, disappointing race results. If you want to improve your time in a 10K or completing a half marathon or even a full marathon, you’ll need a periodized program geared to each type of race. Specially designed periodized training programs are also available for cycling and many other sports. Periodized training will ensure that you continue to make measurable progress, which will keep you energized and interested in reaching your goals. The cyclic structure maximizes both general preparation and specific preparation for sport. Accounting for the individual, including time constraints, training age and status, and environmental factors. Plan your workouts according to your goals. is the most commonly used style of training. This form of periodization gradually increases volume, intensity, and work by mesocycles in an annual training plan. Progressive overload is a major key to the success of this training style. This style is characterized by longer training periods, less reliance on super compensation, and a focus of more general training over specific. This programming style is useful for building a strong foundation, progressing in one variable, and working towards a peaking point. Recommended for those who are newer to training, it’s definitely the easiest periodization style to understand. rely on constant change throughout training cycles. As opposed to a linear periodization that focuses on gradual increase of one variable, this style manipulates multiple variables like exercises, volume, intensity, and training adaptation on a frequent basis (daily, weekly, or even bi-weekly). Non-linear periodization is more advanced than linear and incorporates multiple types of stimuli into a training program. This programming style is an excellent way of individually training one variable and secondarily training others at the same time. It’s often used for those with advanced training backgrounds and longer sport seasons. For example, think about a program that has you train strength one day, then power two days later – this is non-linear. focuses on breaking down specific training periods into 2-4 week periods. It consists of a two-block design, accumulation and restitution. In the accumulation blocks, the focus is directed toward supporting motor abilities while simultaneously developing certain strength qualities necessary for the athlete with a limited volume load. The restitution block is essentially the opposite. They support strength qualities in the athlete, while addressing the development of specific, technical motor qualities with a limited volume load. These training loads must target different abilities (max-strength, explosive strength, max anaerobic power, etc.). The goal behind these smaller, specific blocks is to allow an athlete to stay at their peak level longer, since most sports call for multiple peaks. Within the training season, athletes will only focus on adaptations they need specifically for their sport, if an athlete doesn’t need endurance, they won’t train for it. When trying to maintain a high level of athleticism for competition over an extended amount of time, block periodization can be a great tool. By frequently training specific training adaptations you work towards progressing in your sport with the variable you need, and avoid burning out. Periodization has stood the test of time for the simple fact that there are so many progressions and ways to structure your training so that you can be at your best when it matters most. Failing to utilize any form of periodization for your training could lead to overtraining, failure to recover appropriately for progression, and the inability to see the progress you deserve from the time you put into training. To start planning your workouts, here is a linear periodization template, for free. I know that planning workouts for the first time can be complicated, if you have any questions, do not hesitate to ask me and I will help you.